Well, there it is—the sum total of last year’s early mornings, all-nighters, sleep-ins, and siestas. Each ribbon is a month, with colors representing hours of sleep on a given day. Out of curiosity, I started using the SleepBot app at the beginning of freshman year to log my hours. It’s been over three years since, and I wanted to do something interesting with all the data that’s accumulated. 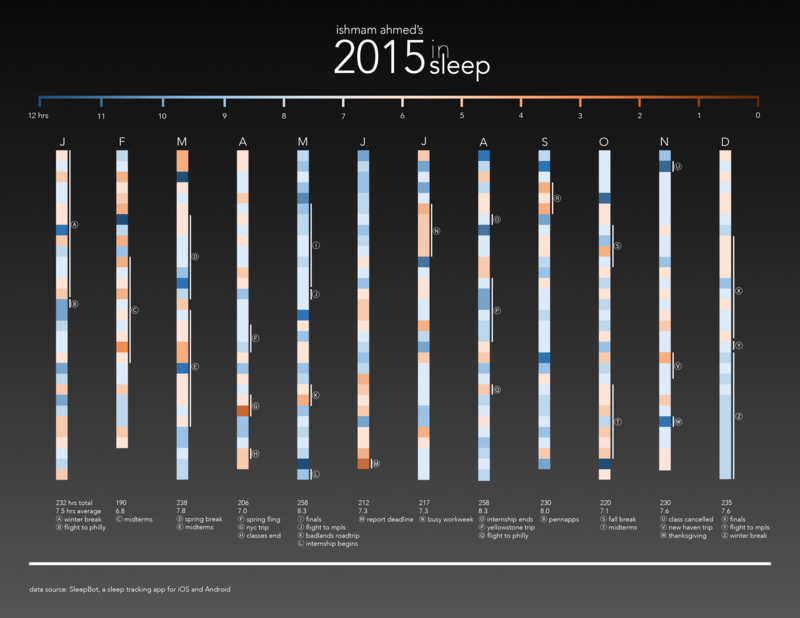 The result is this autobiographical infographic, which I made in order to determine whether sleep beat sleep deprivation for me this past year. Let’s start with data entry. SleepBot makes it really accurate and really convenient; basically, I hit a button right as I go to bed, and again right when I wake up. The app then spits out the total time I slept, and adds the data point to a growing list. I recorded everything from naps to restful holidays this way. In a couple instances when I didn’t have my phone on hand before dozing off, I used SleepBot’s manual entry later to fill the gaps. Designing the graphic was a multi-step process. First, I put all my SleepBot data from 2015 into a 365-row spreadsheet. Because I wanted to highlight the contrast between different parts of the school year, I decided that a color gradient would be a good way to show the range in sleep values. That meant determining the scale you see across the top; I decided that low sleep days would be shown as red, sleepful days as blue, and days with adequate sleep (6-8 hours) as more neutral, in pastel. Once the gradient was set, I matched the values in the spreadsheet with their corresponding color values and organized the months into columns. I wanted the color to speak for itself, so I decided to leave each month as a minimally labeled, uninterrupted ribbon. Lastly, I calculated averages, pulled some anecdotal tidbits from my calendar (to help explain some colors), and wove it all together in Photoshop. First off, turns out I got an okay amount of sleep! I went through freshman and sophomore year a lot more sleep deprived—trust me—but junior year was the year I started being more mindful of my circadian rhythm. I’m glad it actually shows. Other things I noticed? Stretches of sleep deprivation are typically followed by a blue weekend. Light blues never last long during the school year. And darker reds mostly have to do with disruptions to my normal routine, like travel or sharp deadlines. Yes, February was rough. But December was smooth sailin’. In the end, it seems that sleep and sleep deprivation did manage to balance each other out. My aim with this is twofold: first, I wanted to share a bit about myself through an autobiographical infographic for the blog. But I also hope it inspires you to think about what your sleep ribbons might look like. Have you been having a lot of red days lately? Or has your year been mostly pastel so far? Either way, it’s really interesting to think graphically about our lives.